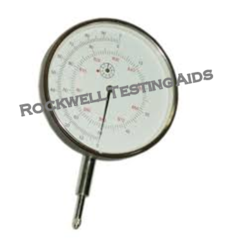 We (Rockwell Testing Aids) Offer to our esteemed customer accessories of hardness Tester such as Rockwell, Brinell, Vickers & Universal Testing Machine. Contact points are fitted with tungsten carbide balls. A solid and rigid outer case helps protect the inner gearing. Movement is fitted on a thick brass plate with jewel bearings. Fixing stem is standard 8mm h6, made from stainless steel and is accurately ground.